the other saturday the kids and i happened to stop by grandma and grandpa's house at just the right time. grandpa still had the "side by side" at their house. it belongs to the company my dad works for and he and my mom had taken it out the day before on some trails for the afternoon. 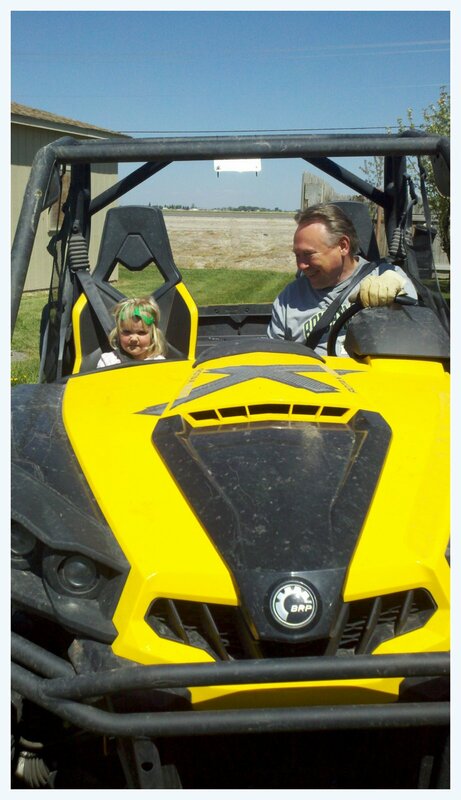 dad was more than willing to take each of my kids on a wild ride. and then he let me take him for a wild ride. it was a lot of fun! this toy packs a lot of punch! owen finished his first year of a music class called let's play music. it's been fun for him to learn how to listen to classical music and recognize different parts, chords, solfeggio hand signs, to learn staff awareness, rhythm skills, and tone bells. owen has had a lot of fun learning the bells and new songs. this is a three year course, and by the time they are through they should be able to start an instrument at an excelled level. owen will be learning the keyboard next year. and wesley will begin his first year. wes already know the songs and bells from watching his big brother. it should be a fun year! that afternoon we headed to the museum to see a t-rex named sue. wesley was so excited! we invited carson , our neighbor, to join us. i think they were almost more excited about the elevators than the dino stuff. a stop to mcdonalds for happy meals made the afternoon just PERFECT! then we came home and built a million airplanes with wesley's new airplane making book and kit. kevin let wesley have an extra long ride/drive on the tractor before we headed to chili's for dinner. we were lucky enough to have grandma and grandpa manwaring join us for cake and ice cream that night! that really made wesley's day. it was a day full of fun! happy birthday bug! our little man turned FIVE! we had such a good time celebrating him. it started early (especially for those who were up until 2am getting ready). he was so excited to open his presents. we did that first thing! kevin could have SWORN he heard wesley say he wanted to be a boxer when he grew up. so, he got his some boxing gloves and a bag to give wes on his birthday. when i asked wes a couple days before his birthday he said, "no, i want to be a DOCTOR!" oh well, either way...he loved his new gloves and boxing bag. wesley was going to do a dinosaur birthday and asked me to do a pterodactyl cake. a couple days before his birthday he changed his mind and wanted a shark cake. i think this was a lot easier than a pterodactyl would have been. enjoying his breakfast courtesy of kevin. this moline boy is PROUD to be riding a john deere tractor! we finished planting the rest of our yard last fall. it's still mostly weeds back there, but must be mowed. i've always done the mowing since we moved in. with kevin working late alot it just made sense. so, the first time i mowed our yard this spring i almost passed out. it took nearly 4 hours to push mow. in the mean time, my kids were running wild and trashing my house. not going to work! 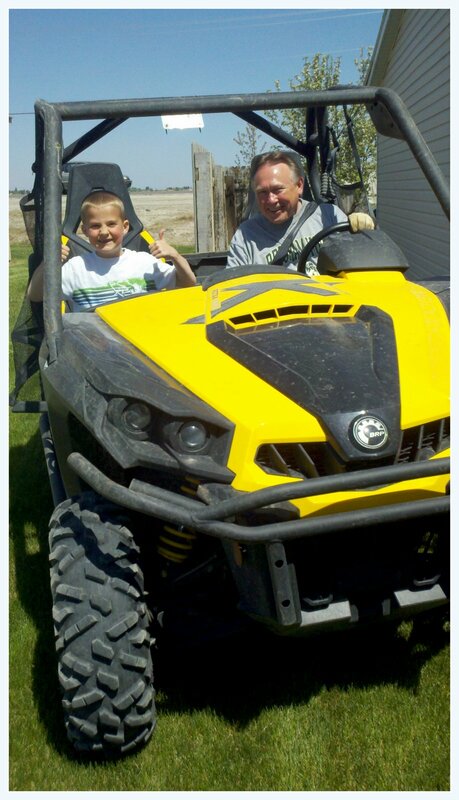 so, we started looking for a riding lawn mower. deep inside i always knew we would end up with something green. 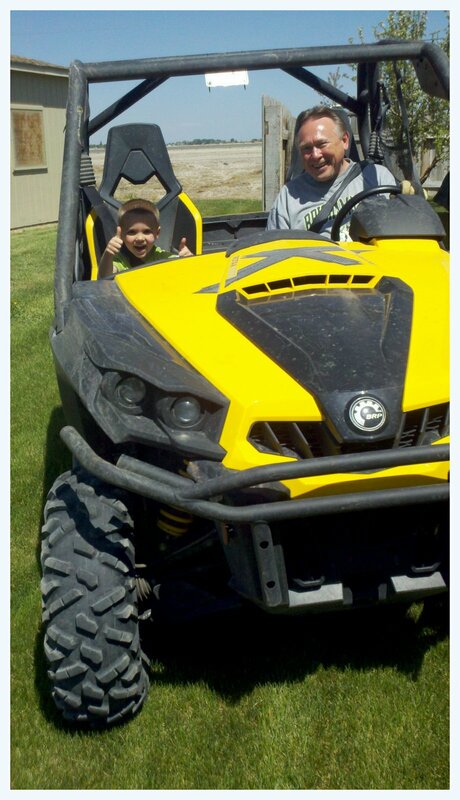 :) kevin was giddy when we brought it home and rode it around the yard and took the kids for rides. their new favorite past time. and now, i watch kevin mow from my comfy patio chair! and he is grinning from ear to ear with each turn. AND...it only takes him 1 1/2 hours. an update on madalyn is WAY over due. this little girls is growing up way to fast! the best name for her would be little miss independent! she doesn't want help getting dressed, going potty, running over to the neighbors, and climbing into the car. 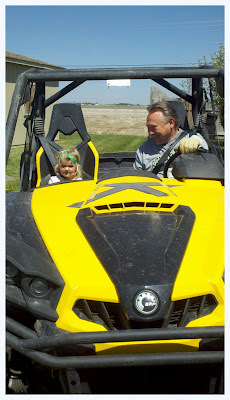 she is 100% girl, but she also can keep up with her brothers and the neighbor boys. she loves to run around with them.if they aren't around when she wakes up from her nap she will ask "where are my boys?" we potty trained her over a two month period. we just kept having things come up. but, she is a pro at it now. we never had to night train her. she just figured that out herself. i peeked in on her during her nap and couldn't resist capturing it in a picture. she is such a sweet little thing! she calls all of her female cousins and friends her "sisters". often she will talk about what they do and will say "my sisters do/say this". i love to hear her talk about sisters. she is so curious about the young women i serve with. whenever we see them around town or at church she will say "mom, are those your girls?" of course i say yes, hope it isn't confusing her. i love this little girl! the perfect combination of sweet and sassy! our little wesley bug is turning FIVE today! this boy brings us so much joy. he takes pride in making people laugh and smile. he is so protective of his little sister. his big brother is his BEST friend. he probably says "love ya mom/dad" 20 times a day. he LOVES to snuggle and hug. but, he doesn't love kisses. he loves running around and playing with his brother and every other six or seven year old and sometimes comments that kids his age are too little. wesley LOVES being in charge and making decisions. he loves to sing in the bathroom and shower. he is very tender hearted. his teachers comment on how well behaved he is at church and school. he will do just about any chore i ask him to do...and sometimes will even do a chore i ask owen to do before owen can think twice. a great helper! we love this little man! so thankful he is part of our family! we've got a good one! wesley takes so much pride in making his bed. i just had to take a picture.